There is no one universal definition of a lie. Some people believe omitting information isn’t a lie. Others suggest that engaging in fancy word play, alluding without being specific is also not a lie. Under the broad heading of Deception, there are different kinds of lies: White lies. Fibs. High Stakes lies. Untruths. Omission. Evasion. Some words are used interchangeably. Learn what makes a lie a lie. 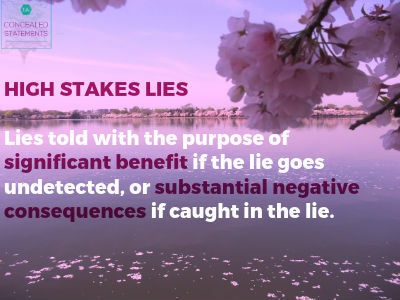 For the sake of deception detection, when I talk about lies, I am speaking about high stakes lies – those told with the purpose of significant benefit if the lie goes undetected, or substantial negative consequences if caught in the lie. I prefer to use Paul Ekman’s definition of a lie which includes two requirements: A deliberate intention to mislead, without prior notice. There has to be intent to mislead. Omitting information or wording it in such a way to skirt the truth meets the requirement of intending to mislead. The intent of a social lie, or a white lie, is generally to avoid hurting someone’s feelings, not to mislead. Stating something that is untrue doesn’t meet the criteria of intent to mislead if the person making the statement genuinely thinks it is true. They may be mistaken, or were misinformed about the facts, but without the intent to mislead, it’s not a lie. Generally we are not notified in advance that we’re about to be lied to. Although there are some instances we have prior notice. Consider actors or poker players – both examples of an intent to deceive. Kiefer Sutherland wants us to believe he is Jack Bauer. Poker players often bluff about the cards they are holding. We have prior notice when we turn on the TV or sit down at a card table that we will be misled. A wife may have a very good idea her spouse isn’t being faithful; or a parent fairly certain their teen is on drugs. Yet by colluding, having a secret, unspoken understanding, they don’t have to deal with what is on the other side of facing the truth. They have prior notice that the excuses given about their whereabouts or behavior aren’t the truth. An applicant wants to get hired but doesn’t want the employer to know there was a 90-day gap in employment due to time spent in jail, so the question about previous convictions is intentionally left blank or checked No. Since there is no universal definition of a lie, people can have different interpretations, which could lead to relationship issues. If you’re one who omits information and justifies it as acceptable because you’re not actually lying, now you know differently. It’s still deception. If you’re on the receiving end of a lie, know that most people do not lie. Instead they omit. You may need to ask more questions and listen carefully to what they are not saying. If you may be colluding and allowing yourself to be lied to, at least admit it to yourself. You now know that you’ve silently given permission for that to happen. Only you know if you’re ready to confront the issue. Be sure to connect with me on LinkedIn, and follow me on Twitter.